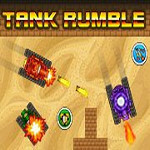 Tank Rumble 2 Player War Game - HiHoy - Play Cool Games! A great game begins for the persons who love tank battles. This game is different than the other games because it contains split screen gaming feature. You can collect various power-ups and gun upgraders to have advantage against your friend or have this advantage against the CPU and by this way try to win the battle!